Home › Investing › Broker › Robinhood Penny Stocks – $0 Commissions! Robinhood Penny Stocks – $0 Commissions! 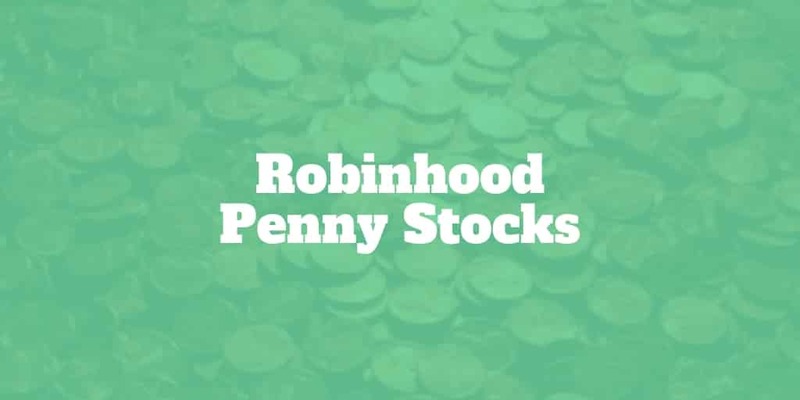 If you are looking for the cheapest stocks on Robinhood penny stocks are an obvious place to being your search. But it won’t take long before you discover that the best stocks under $1 are not necessarily the best places to invest your hard-earned money. While it’s tempting to buy marijuana stocks that are low-priced or scan a list of blockchain stocks under $1 in the hopes of a big payday, the odds are against you hitting bingo. Even though most traders think of penny stocks as companies whose prices trade under $1 per share, the SEC defines a company whose share price is trading under $5 as a penny stock. Using that definition, Robinhood penny stocks are plentiful. For example, daily deals site, Groupon [GRPN], is counted among the numerous penny stocks available to trade. Plug Power Inc [PLUG] is another highly rated stock. Although less well known to consumers, Plug Power is an alternative energy technology provider that has an enviable customer list, including Amazon. Analyst expectations are high for Plug. Most rate the company a Buy and forecast large revenue increases over the next year. UTStarcom Holdings [UTSI] is counted among the top penny stocks on Robinhood too. Though not a household name, UTStarcom develops technology for cloud-based services, mobile, and streaming, as well as WiFi products and optical fiber. Although it’s possible to find stocks under $5 on Robinhood, which technically according to the SEC are categorized as penny stocks, finding stocks under $1 is likely to leave you disappointed. Investors who trade penny stocks usually find them on the Over-The-Counter market, or OTC, which is commonly called the Pink Sheets. The over-the-counter market is not actually an exchange. Trading takes place between buyers and sellers with no exchange oversight. Often, stocks trading on the OTC market are good early-stage companies. Solid companies with tens of millions of dollars in revenues but that do not qualify for a public IPO listing on the NYSE or NASDAQ market may decide to raise money by going public on the over-the-counter market. Equally, companies trading on the OTC market could be low quality companies that have been delisted from the NYSE or NASDAQ exchanges. The challenge for investors is picking the good companies from the bad ones. And here’s where the plot thickens! No matter how hard you look, you won’t find a list of Robinhood penny stocks trading on the OTC market. Generally, stocks trading under $1 on the pink sheets are considered speculative and Robinhood avoids them. So, if you’re looking for a Robinhood penny stocks list, you’re stuck with companies trading on the NASDAQ or NYSE. When you find NYSE stocks under $1 or NASDAQ stocks under $1 on Robinhood you can bet your bottom dollar they won’t be there for long because both exchanges delist low-priced stocks within about a month usually. That means the best penny stocks to watch on Robinhood are stocks under $5 but over $1. An alternative to trading penny stocks on Robinhood is to find a broker that supports the pink sheets. Even top options brokers like tastyworks who you might intuitively guess support stocks under $1 come up short. Instead, you’ll need to sign up to TD Ameritrade or another top broker. TD Ameritrade has a few trading platforms under its umbrella but the most complete one is thinkorswim. Finding a list of penny stocks on thinkorswim is a breeze. A thinkorswim penny stock screener is all you need to quickly scan and find stocks under $1. As one of the best trading platforms, thinkorswim can perform just about any screen or scan you might fathom. Heck, you can even use thinkScript, an embedded programming language, to create your own technical studies if you wish! Some investors shy away from penny stocks because they are riskier investments. It’s hard to tell if a penny stock will truly explode, yielding high profits, or if you will lose your money. But the returns on these stocks make them alluring, and if you know what you’re doing, you could enjoy some big wins. Before risking a single penny, here is a list of qualities to look for when considering penny stocks to trade. Strong fundamentals are one of the best indicators of a stock that will do well over time. When considering penny stocks to invest in, you want to look closely at their fundamentals. Penny stocks with a positive assets-to-liabilities ratio, positive cash flow, and that are making a profit may be good bets. Don’t forget to look at qualitative aspects of the company’s annual report too; statements about performance and plans and predictions for the future can help you gauge a company’s health before you invest. A penny stock that takes off and generates large profits could be a good investment bet. Penny stocks with big upsides offer lots of potential but it can be hard to predict whether a penny stock is going to explode higher, so factor in the risk of the rocket ship exploding too before you invest. As long as you do your due diligence ahead of time and follow the stock market closely, you can get a better idea of which stocks are likely to burst higher and get in on them while they are at rock-bottom prices. Always look at any prospective penny stock’s chart to help you evaluate its potential performance. Positive technical trends show that a stock is on the upswing and may continue upwards for some time, making the stock likely to yield significant returns on your investment. Some companies are hot commodities because of the type of company they are. Tech companies, for example, can be explosive, so if there’s one trading at low prices, it may be worth exploring further. In addition, pay attention to trends in the news. For example, legalization of marijuana in several states has led to the opening of new cannabis-based businesses that could attract significant investor attention. If it’s your first time trading low-priced stocks, create a checklist so you don’t fall victim to common penny stock scams. Although regulators have cracked down on the pump-and-dump merchants who tout cheap stocks in the hopes of cashing in as they rocket higher only to quickly crash back to earth, it’s best to keep your wits about you. If you hear about a new drug therapy that could cure cancer, call the Investor Relations department of the company and ask for more information. Make your investment decisions calmly to avoid buying on emotion. >> Read this primer on behavioral finance biases and how they affect investment decision-making if you’re a stock market beginner. And be wary of any free stocks tips that friends share with you. It’s one of the common trading pitfalls and often a costly one. If you’re looking for a list of Robinhood penny stocks to trade that are the next high fliers, you might be in for some disappointment. While the SEC defines stocks under $5 as penny stocks, and many stocks on the free Robinhood app fall into this category, traders looking for the cheapest stocks under $1 will be disappointed. The company that made free stock trading famous does not support over-the-counter stocks. A better bet is to choose one of the best brokers like TD Ameritrade and specifically its thinkorswim platform. Screen for fundamentally strong penny stocks or ones with good odds of powering higher through game-changing technology or innovative medicines. No matter which path you choose, steer clear of the common penny stock trading mistakes like buying because a friend told you so or picking stocks that have very low trading volumes.